As former republics of the USSR - home of the KGB - it should come as no surprise that Armenia and Azerbaijan both have dedicated national intelligence services, respectively called the National Security Service (NSS) and the Ministry of National Security (MNS). Since these two countries are essentially in a state of war over the contested territory of Nagorno Karabakh (NK), both intelligence services are assuredly tasked with stealing each other’s secrets (collecting intelligence) and preventing the other from doing the same (counterintelligence). To this end, the NSS and the MNS periodically announce the arrest of citizens accused of conspiring with the enemy. These press reports are typically fairly brief and do not disclose the techniques used to detect the alleged espionage. Nevertheless, they do occasionally contain nuggets of information, which provide a window into the inner workings of the NSS and MNS. The objective of this article will be to comparatively assess each country’s intelligence and counterintelligence capabilities, objectives, and operations based on publically available information. With regards to Baku-controlled agents, one of the most intriguing cases to emerge in recent years was the arrest of Armenian soldier, Mane Movsisian; NK soldier, Rafael Avagian (referenced above); and Avagian’s friend, Davit Barseghian. [vi] The three operatives were reportedly recruited online by an Azerbaijani intelligence (presumably MNS) officer, who used a number of personas on social networking sites such as Facebook. [vii],[viii] The accused claimed their handler initially masqueraded as a Diasporan Armenian in Turkey who said he was seeking military and infrastructure related information for NK in order to appropriately prioritize/direct a forthcoming charitable gift. If this story has any element of truth, it can be inferred that some MNS officers carry out false-flag asset recruitment using their near-native Armenian-language speaking abilities. One year after Movsisian et al. were arrested, Armenian media reported that the NSS carried out a concerted disinformation campaign against the MNS, which allegedly continued to try and recruit Armenian and NK military personnel using the exact same online personas. [ix] Upon initial observation, this public revelation appears to be part of an Armenian information campaign that was intended to embarrass the MNS, because using the same cover clearly reflects shoddy intelligence tradecraft. However, the disclosure of the disinformation campaign also likely compelled Baku to recall/ignore whatever intelligence it received from its social media sources between mid-2013 and mid-2014. While this may initially seem like a setback from Baku’s perspective, in reality, it would likely benefit the MNS since its eyes were effectively opened to a previously unknown issue, giving Azerbaijan the opportunity to rectify a problem it may not even know existed. Given the inherent benefit of keeping the NSS disinformation campaign secret, one may naturally ask why Armenian media outlets were allowed to publicize it in the first place. There are a number of plausible explanations that may account for this seemingly irrational decision. First, the revelation could simply stem from an unintended leak, reflecting poor Armenian operational security (OPSEC) or bureaucratic ineptitude. It is also possible the MNS learned of the disinformation campaign prior to its public revelation. If the NSS was able to detect the MNS’ awareness, the former may have opted to disclose the program, reasoning that the benefit of humiliating Baku superseded the risk of publically revealing a program that the MNS had already discovered. Another distinct possibility is that, upon further investigation, the NSS realized the MNS online personas continued to recruit sources and collect bona fide intelligence even after Movsisian and the two other soldiers were arrested in mid-2013. By trumpeting the disinformation operation, the NSS may have intended to discredit (at least in the eyes of the MNS) intelligence that was actually both legitimate and damaging. In other words, it may have been an Armenian attempt to trick Azerbaijan into figuratively dumping the baby out with the bathwater. Whatever the reason, the revelation likely reflects a sophisticated intelligence-counterintelligence dynamic between the two warring sides. Media reports also shed light on how the intelligence services are able to access enemy territory and contact HUMINT assets. For example, former Armenian police Colonel Khachik Martirosian was arrested for espionage in early 2014. [x] The NSS claimed Martirosian had been co-opted by (likely official cover) MNS officers, who were operating out of Azerbaijan’s embassy in Tbilisi. The MNS’ decision to run HUMINT operations out of Georgia makes perfect sense given that country’s shared borders and good relations with both Azerbaijan and Armenia; and it’s only natural to assume the NSS leverages Armenia’s Tbilisi embassy for the same purpose, even if there is no evidence indicating as much. In addition to using Georgia as an access conduit, Baku also appears to conduct intelligence operations via Iran. In this vein, the 2009 arrest and 2010 trial of Behnam Bagheri revealed the MNS tactic of using ethnic-Azeri, Iranian nationals to gain entry into Armenia. [xi] This demographic group likely appeals to the MNS for several reasons. Not only are ethnic-Azeri Iranians more inclined to sympathize with Baku’s position regarding NK, but they also compose ~20% of Iran’s population. Due to their large numbers, Yerevan cannot bar them from crossing into Armenia, since it would undoubtedly prove economically damaging and would harm Armenian-Iranian ties (which Yerevan is keen to foster). In contrast, Armenian Iranians compose of less than 1% of Iran’s population, which means Baku is likely able to enforce a de facto travel ban against them (just as they do against other third-country national, ethnic Armenians). [xii] In other words, the NSS probably cannot route intelligence operations through Iran as easily or effectively as the MNS. Behnam Bagheri’s trial is also revealing because it was claimed that he tried to smuggle sensitive footage across the Armenian-Iranian border. [xiii],[xiv] The fact that a likely MNS asset had to go through such lengths to transfer his collected data to his handlers weakly suggests (i.e. by no means confirms) that the MNS lacked a clandestine operating base/station/safe house in Armenia as of 2009. It may also indicate the MNS lacked the technical infrastructure, know-how, or training to electronically send and retrieve sensitive material (e.g. encrypted email), thereby necessitating risky real-world smuggling operations. A final issue worth discussing is the fact that there are far more reported cases of Azeri assets being arrested in Armenia than vice versa. Moreover, there also appears to be a significant qualitative difference in terms of those arrested in each respective country. Most alleged MNS assets, for instance, appear to have had plausible access to sensitive Armenian security information as a result of their positions as soldiers and police officials. In contrast, Baku only appears to have arrested journalists (Rauf Mirkadirov) and human rights defenders (e.g. Leyla Yunus), individuals who probably just ran afoul of the Aliyev regime and likely did not have access to actual intelligence. [xv] It is possible this disparity could simply reflect the relative size of each country’s HUMINT program, as discussed earlier. That is to say, more MNS assets were arrested than NSS assets simply because there are more of the former. It’s also possible that NSS counterintelligence capabilities are more sophisticated than the MNS’, hence the larger number of arrests. Another potential theory is that the NSS and MNS have different policies in terms of publically revealing espionage cases. Yerevan may intentionally publicize spy-related arrests as a means of deterring other Armenian officials who might otherwise be tempted to betray their country. In contrast, the MNS could believe that public disclosure will only serve to highlight Armenia’s competency and reveal Azerbaijani weakness. In other words, it is possible Baku arrests far more legitimate Armenian spies than it is willing to publically disclose. While this article sought to provide an overview of Armenia’s and Azerbaijan’s HUMINT operations, it is important to acknowledge that there are many different types of intelligence, including signals intelligence (SIGINT) and imagery intelligence (IMINT). Meaning, one country’s HUMINT advantage may not necessarily extend to SIGINT, IMINT or any other type of intelligence. Furthermore, the NSS’ and MNS’ respective ability to integrate their collected intelligence into defense/war plans and operations also remains a key information gap…one which is unlikely to be covered in regional media reporting. 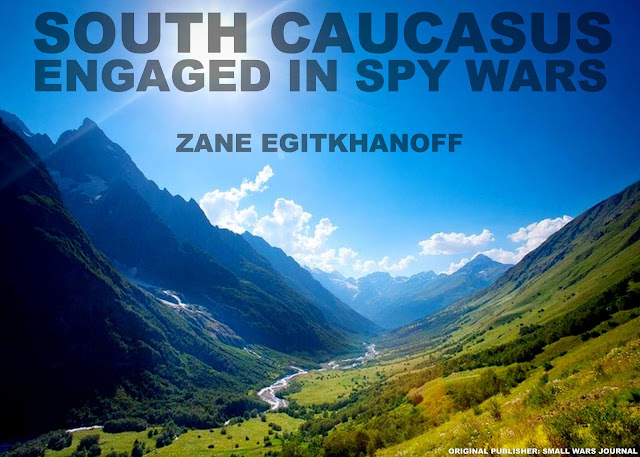 Zane Egitkhanoff is an analyst for the Department of Defense. The contents of this article do not constitute or reflect official US government policy or analysis.